Moonstone and Garnet necklace. I picked the pendant up in SF's Chinatown and the moonstones are from my great-aunt's collection. Malachite necklace and bracelet. I found that gorgeous pendant in downtown Scottsdale, AZ. For downtown prices, the cost was a steal. For anywhere else, I paid too much. However, the pattern is very unique - and perfect. I couldn't pass it up. 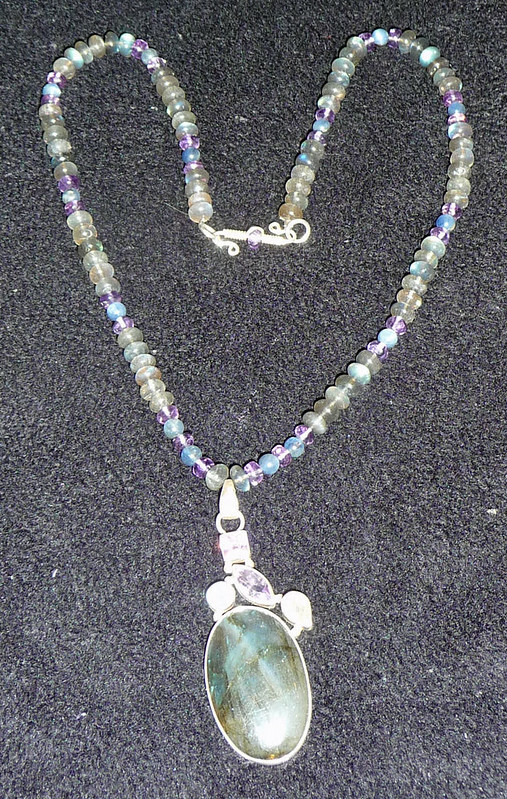 Laboradite and amethyst necklace, with a bit of kyanite mixed in. I found the pendant at a Gem Faire in Santa Rosa and couldn't resist. This entry was originally posted at http://merhawk.dreamwidth.org/537923.html. Please comment there. If you don't currently have a DW account, you can use OpenID or create your own account for free.